The study of several aspects of the collective dynamics of interacting neurons can be highly simplified if one assumes that the statistics of the synaptic input is the same for a large population of similarly behaving neurons (mean field approach). In particular, under such an assumption, it is possible to determine and study all the equilibrium points of the network dynamics when the neuronal response to noisy, in vivo-like, synaptic currents is known. The response function can be computed analytically for simple integrate-and-fire neuron models and it can be measured directly in experiments in vitro. Here we review theoretical and experimental results about the neural response to noisy inputs with stationary statistics. These response functions are important to characterize the collective neural dynamics that are proposed to be the neural substrate of working memory, decision making and other cognitive functions. Applications to the case of time-varying inputs are reviewed in a companion paper (Giugliano et al. 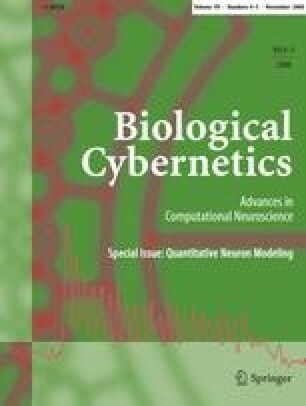 in Biol Cybern, 2008). We conclude that modified integrate-and-fire neuron models are good enough to reproduce faithfully many of the relevant dynamical aspects of the neuronal response measured in experiments on real neurons in vitro. G. La Camera is supported by the Intramural Research Program of the National Institute of Mental Health. M. Giugliano is supported by the European Commission (FACETS Project FP6-2004-IST-FETPI-015879, EUSynapse Project LSHM-CT-2005-019055). W. Senn is supported by the Swiss National Science Foundation, grant No. 3152A0-105966. S. Fusi is supported by the Swiss National Science Foundation, grant PP00A-106556. The views expressed in this article do not necessarily represent the views of the NIMH, NIH, or the US Government.